Flip the switch. The light comes on. Simple, right? My wife didn’t like the lights in the dining room and the bedroom at our new house. The dining room light wasn’t big enough, or grand enough for her taste, and I agree. The bedroom light was a small pendant light, not bright enough to read by, so it too, had to go. It really isn’t difficult to install different lighting. If lighting exists already, you can flip the switch to the “off” position, and remove the fixture without getting an electric shock. Most lights will have a white, black, and a bare copper ground wire. If you’re in an old house the wires may both look the same. In the dining room, I am installing a new chandelier style light fixture that is bright with five lights. The fixture has a long chain which we are using to take advantage of our space, and center the light above the dining table. We got a great deal on this light at Menard’s. It was the last one; the display model. We got it for about 60% off its original price. Another benefit of the display model was that it came pre-assembled. I utilized the electrical box that was already in the ceiling. I did add the support bracket that came with the new light fixture, and hooked up the white, black, and ground wires to the corresponding wires in the ceiling with wire caps. After that, I had my wife flip the switch to verify that the lights would come on. They did, so I used electrical tape on the wire caps to secure them better, and finished the job by attaching the housing to cover the wires. The chain on our new dining room chandelier is secured to the ceiling by a hook that can be screwed into either drywall or solid wood. If was as simple as making a mark where we wanted, and pre-drilling a hole at the size specified on the hook’s packaging. My wife and I couldn’t be happier with the new light. 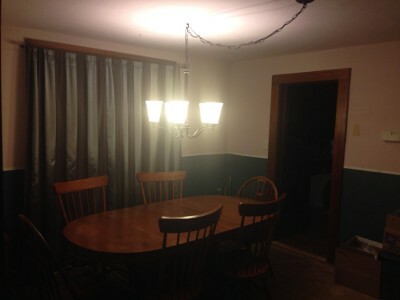 It really makes a difference with the brightness and positioning of the dining room chandelier! In the bedroom, installing new lighting is more of the same story. I flipped the switch to the “off” position, and removed the old light fixture. It was a small, dark pendant light. 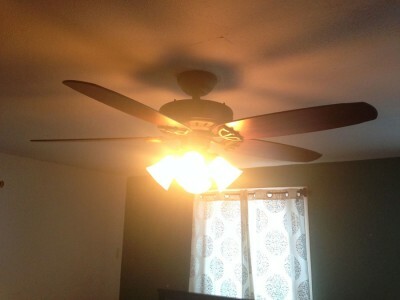 We replaced it with a 4-light ceiling fan. My wife and I both like to have a fan blowing in the summer, so it was a natural choice for us to go with a ceiling fan/light combo. This is a Hunter brand fan, and is both form and function. We really like it. We have an old house, and with it comes old wiring. The box in the ceiling is a bit smaller than I’d like to see, which made getting all of the wiring inside difficult. These newer ceiling fans really are a breeze to set up though, and I’d wholly recommend a Hunter lighting fixture to anyone.